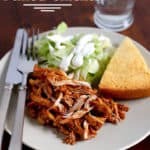 This Pulled Chicken comes together in minutes in your Instant Pot or electric pressure cooker. It’s an easy way to enjoy the flavor of BBQ all year long! The next day she texted me that her daughter requested BBQ Pulled Chicken as the inaugural Instant Pot recipe. This sounded good to me. 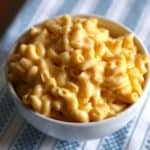 It’s an excellent recipe for any pressure cooker devotee and it’s especially nice for beginners. You only need five ingredients and the recipe cooks in fifteen minutes under pressure. For this recipe, get a package— or two—of boneless, skinless chicken thighs or breasts. They cook up tender and flavorful. But most importantly, they have a great texture for shredding. The thing about barbecue sauce, no matter which brand you use, is that it’s thick. This can cause trouble for a pressure cooker. To reach and maintain pressure, pressure cookers need steam. If the cooking liquid is too thick, sometimes it doesn’t generate enough steam and the pressure cooker doesn’t reach pressure. This happened to me the first time I made pulled chicken in my Instant Pot. Steam poured out of the valve but there wasn’t quite enough to lift the valve into place. It was really frustrating. To solve this problem, add a tablespoon or two of water to the barbecue sauce. If your sauce seems really thick, use two tablespoons. The sauce gets thickened at the end of cooking. So don’t worry about adding too much water. The chicken cooks in fifteen minutes under pressure. When the cooking time completes, release the pressure with a”quick release.” If you do a natural release, the chicken can overcook, making it hard to shred. Fun fact: meat that’s overcooked in a pressure cooker gets tough, not tender. It’s the opposite of meat in the slow cooker. Remove the chicken from the pot with a pair of tongs and place them on a plate. Don’t shred the chicken right away. Allow the chicken to rest for about five minutes. This allows the muscle fibers to relax and makes them easier to shred. Use two forks to shred the chicken. This takes a minute or two but is worth the work. When you first open the pressure cooker, you’ll notice the sauce is a little thin. No problem. While the chicken rests, turn the pressure cooker to saute. If your pressure cooker has a low temperature setting for saute, use it. Cook the sauce for a few minutes to thicken it. Be sure to stir the sauce frequently as it cooks or it might burn. Place the pulled chicken on a hamburger bun. (Toast and butter the bun if you feel like it.) Serve with coleslaw and oven-baked French fries. Serve with cornbread (Jiffy makes a great easy-to-use mix) and greens. Sometimes I make collard greens, other times I serve it with a big salad and call it a day. 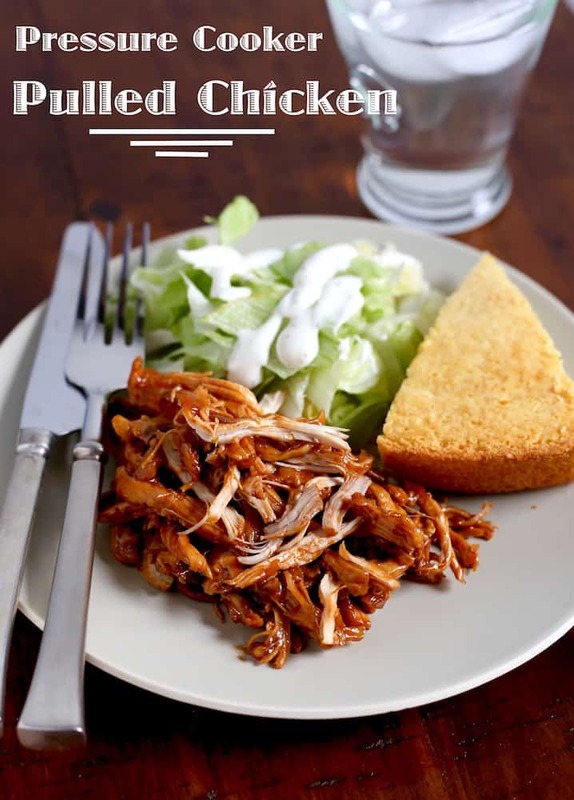 Pressure Cooker Pulled Chicken is quick and easy way to enjoy the flavor of BBQ all year round. Serve on toasted hamburger buns or with a side of cornbread or French fries. Select the saute setting on your pressure cooker. Heat the oil until it shimmers but does not smoke. Add the onions and cook until soft, about three minutes. Add the garlic and cook for an additional minute. Turn the saute function off. Add the chicken. Pour the barbecue sauce and water over the chicken. Stir to coat the chicken with the sauce. Lock the lid into place. Set the pressure valve to the "sealing" position. Cook on high pressure for 15 minutes. When the cooking time completes, quickly release the pressure by turning the pressure valve to "venting." Open the lid away from your face and remove the chicken from the pot with a pair of tongs. Place the chicken on a plate and allow to rest for five minutes. While the chicken rests, turn the pressure cooker to the saute function. Set the saute function to low. (On an Instant Pot, hit "saute" then press "adjust" until the light over "less" is lit.) Cook the sauce until it thickens, about three minutes. Stir frequently to prevent the sauce from burning. Remove the pot from the pressure cooker and place on a trivet. Using two forks, shred the chicken. Pour half the remaining barbecue over the shredded chicken. Adjust the amount of sauce as desired. Barbecue sauce tends to be thick and can sometimes cause a pressure cooker not to reach the correct pressure. To solve this problem, add one tablespoon of water to the sauce before using. If your sauce seems especially thick, add two tablespoons of water. The sauce is thickened at the end of cooking. So don't worry about adding to much water. Pressure cooker is great, it helps food cook faster. I used Stubbs original BBQ sauce. Its thinner so worked great. I still added 1-2 T of water because I wasn’t sure if pressure would stay up but no worries. I also used a stovetop pressure cooker with delicious results. I’ll have to try that sauce! Glad you liked it! 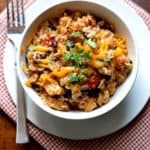 How would you adjust the cooking time and ingredients for 5lbs of breast? Would you be concerned about the meat getting dry with that much in the pot? This is for a party and I don’t want to mess it up! I recommend filling the pot no more than halfway full. 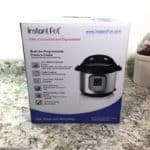 So you might want to do two batches of 2.5 pounds if you have a smaller Instant Pot. Other than that, everything else should work great! Just remember to increase the other ingredients so you have enough sauce. Hi! I’m wondering, in the body of your text it says “the chicken cooks in ten minutes under pressure,” but the instructions say 15 minutes. I’m worried about undercooking, and overcooking, lol. The breasts I usually buy are fresh, not frozen, but pretty large, if that matters. How long do you recommend? Thanks so much! Thanks for catching this. I updated the recipe because I found that I preferred the texture of a 15-minute cook time. I’ve updated the box. Sorry for causing this confusion. After cooking for 15 min, my frozen breasts were still frozen. What’s going on? Were the breasts cut into pieces or were they whole? And, did your pot reach pressure for 15 minutes? My chicken is frozen.. how much time would you suggest adding? Hi Cassi! Believe it or not, you don’t need to add extra time. The machine takes longer to come to pressure and will take longer to cook overall but you don’t need to add on extra time. Cooking from frozen is great to know! Always forgetting to get something out of the freezer. Just checking, I am using the pressure cooker button on high, not poultry button, correct? Yes! Pressure cooker button, not poultry. BUT we can use poultry button, correct? All presets, except for rice, default to HIGH pressure and poultry button is 15 minutes. Yes, that should work! I don’t test recipes using presets since different brands behave differently. Hope that helps! This turned out well for me but after 15 minutes the chicken was still a bit pink (I started with frozen breasts). After another 5 minute cycle they were perfect. I also used homemade bbq sauce which was delish! Yum! I used Sweet Baby Rays BBQ sauce, added 1 T of water and 1 T of Worcestershire sauce and a little black pepper. I didn’t have onion or garlic on hand, so I omitted that step. Turned out great! Unfortunately, I had already bought my ingredients before reading the recipe, and my BBQ sauce had the corn syrup. So I compensated by adding about a cup of chicken broth. It took a while, but it pressured up, and with the 15 minute cooking time, the chicken turned out perfect. However, since the sauce was a little thin, I added some of the uncooked sauce from the bottle. Fabulous!